infants Archives « Breastfeed.Babywear.ClothDiaper.Naturally! Breastfeed.Babywear.ClothDiaper.Naturally! Sometimes being a baby is rough stuff. Teething is a common frustration to many babes and parents as they grow an amazing 20 teeth in the first couple of years of life, starting around 4 to 7 months of age usually. Your babe may settle into predictable preferences for getting through those rough patches but if you’re at wit’s end, make sure you’ve covered all your bases. Is it something else? Sometimes it’s hard to tell if baby’s signs of discomfort are from teething, hunger, tiredness, boredom, or any combination of these and a number of other factors. 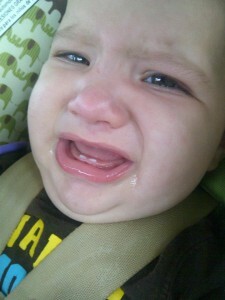 For example, baby may be comfortable enough in spite of teething but really just needs a new diaper. You may be your baby’s best medicine! Maybe baby just needs a little love. When we don’t feel well most of us would appreciate just a little more TLC. A few extra cuddles may be just what your babe needs. They provide love and distraction from mild pain. Use all the tools available to you. 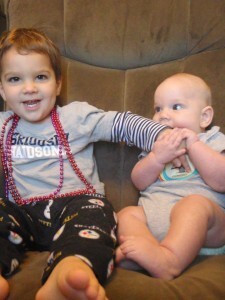 Teething rubs can prove helpful but don’t forget to utilize soft, cool teethers and silicone teething jewelry too. A clean wet rag can do the trick too. Your baby may gravitate toward one or just prefer (hopefully clean) fingers, especially yours! Amber necklaces are a go-to for many caregivers trying to cut down on inflammation and irritability. Hit up the kitchen. With your babe’s child and feeding abilities in mind consider if food can help. Freeze a juicy fruit or some breastmilk to offer something to chew on, if old enough. There are also teething foods that cater to being gnawed on (like Happy Baby gentle teething wafers found in many Walgreens and Targets). Medication. Consult with your physician to ensure you offer your child the most appropriate remedy based on their age and individual needs. Tylenol may be offered sparingly for older children. Teething tablets may also provide relief, although some brands were recently the subject of a warning by the FDA, despite the fact that they were taken off the shelf in 2010 and deemed safe enough to sell again. Familiarize yourself with the risks of using some over the counter teething gels. Balm! Baby offers two natural and organic teething rub options, including one catered to getting a good night’s sleep. In today’s culture of mass, cheap consumerism, it’s sometimes a challenge to go against the grain. Whether it’s because of your budget or parental and personal perspective, there is a growing trend in minimal everything, including toys. By providing objects that foster creative play you actually provide for your child an endless array of options. Some things, whether specifically a toy or not, offer the open-ended opportunity for your child’s imagination to flourish. Fewer toys may also provide opportunities for deeper, more focused play rather than short attention to a great variety of toys. For me there is endless joy of having less clutter around the house in general. Clean up becomes less of a challenge by the mere fact that it takes much less time. Toys are also opportunities for learning beyond the toy. Fewer toys in the home offer more opportunity for a child to cherish and appreciate something. If it is easily replaceable a child might be more careless with it. Some developmental ages may care less about this than others. Some might think fewer toys mean a child will be stingier in sharing but I’ve found fewer toys mean more storylines, role-play, and relationship with peers. To help your kiddo find more enjoyment in what they have and not how much, below are a few things, but certainly not everything, that work for us. Flaunt what you’ve got. The kitchen is a great spot for toys that aren’t really toys. 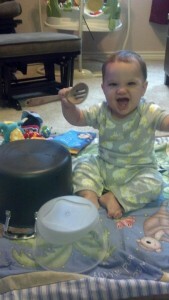 Utensils, pots, pans, and more. Nature has craft supplies (sticks and leaves, anyone?) and a variety of time-burning and learning opportunities (what shapes can you find in the clouds?). Multi-purpose what you can. As with safe household items, everyday kid’s items also offer play opportunity. For example some teething items are also toys, blankets can become tents, and so forth. Crafts, crafts, crafts. I do not (necessarily) mean pre-packaged crafts where you just do as the instructions say. These have their place, but so do simple paper, drawing utensils, and random things. The possibilities are endless with everything from sparkles to special papers in the craft store to a nature walk’s leaves and pages from magazines, mailers, and old birthday cards. 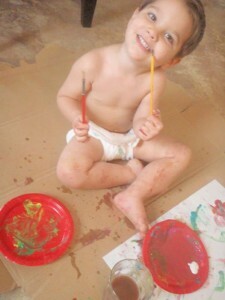 While some of the things mentioned are for older children, even older infants can enjoy a basic color and paper. Books. You don’t need to amass your own library, though I have found my children like to go back to some books on our bookshelf over and over. You can also establish a book exchange with friends or invest in your local public library. The trip to the library in and of itself offers the opportunity to learn about being quiet, caring for other’s property, and other aspects of responsibility. Many libraries also have story time or other child-friendly activities that spark the heart and imagination of kiddos. Keep it simple. Investing in too many can be a bad thing. It’s great to have blocks, trains, animals, kitchen/hardware/pretend play items that can serve more than one purpose If you have so many that they overwhelm the child then you defeat the purpose of minimal toys. Don’t forget yourself. As in, your whistles, coos, goofy faces, and general interactions all can provide your child entertainment and growth, especially for toddlers and babies. Actively playing with your kiddo with a toy can bring it to life in a whole new way. Lynette is a mom of three children from five months to age four. She has cloth diapered all three since birth and enjoys all things eco-friendly and mindful living. It was the second day of school for my math teacher husband when I went into labor with my second daughter. He returned to work when she was five days old. I like my privacy postpartum, and do not enjoy visitors for the first couple of weeks, so it was me, the newborn, and my two year old on that Monday. How was I going to entertain my toddler, who was adjusting to being a big sister and sharing Mommy with a baby who wanted to nurse every couple of hours for 45 minutes? I attempted to think of activities to keep my toddler busy and keep her interested for 20-30 minutes at a time that took little to no time on my part to set up. I relied on the following daily. Books. My toddler loved running to her room and bringing me book after book to read while I was feeding her sister. Lots of coloring books/sticker pads/play-doh. I learned very quickly that when I was pumping, my toddler wanted to be close to me. I could put her in her booster seat, give her a coloring sheet and some crayons, and she was good to go for my pumping session. A friend gave me a reusable sticker pad that my toddler could use at the table without me worrying about stickers being stuck to everything while I was feeding the baby. Blocks/Puzzles. These toys encourage my toddler to play independently while I was feeding the baby. I could supervise her from recliner but did not have to direct her play. Feeding stuffed animals. My toddler would grab her favorite stuffed animal and sit by me and pretend to feed her while I was feeding the baby. I got to cuddle both my daughters and my toddler got to be like Mommy. Swiftering/cleaning/helping Mommy. I have a small Swifter 360 that is my toddler’s Swifter. I could give her the Swifter and she could entertain herself for a half an hour or so by cleaning the chairs, paintings, etc. around the house. Bonus was that she did my dusting for me! Screen time. Although we limit my toddler’s screen time, Daniel Tiger helped me get through some tough days. I could put an episode on the tablet, and my toddler would be entertained for half a feeding. If all else fails, selfies! 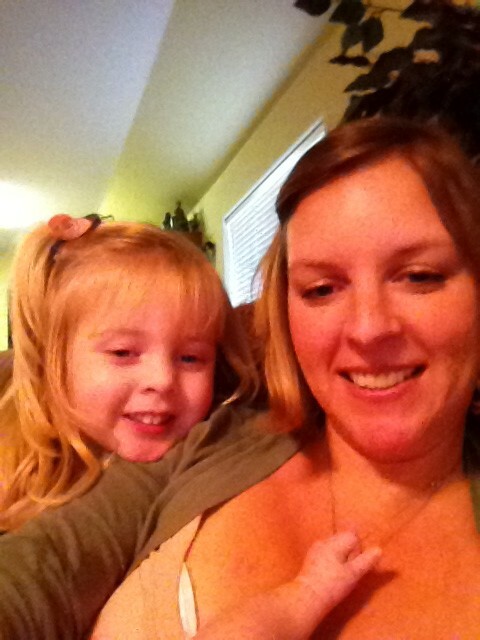 Becky Nagel is a stay at home mom to an energetic, spirited toddler and a happy, easy going baby from Denver, Colorado. She enjoys running, hiking, and cooking with her two girls. Schooool’s (no longer) oouut for the summer! It’s that time of year. Perhaps you’re elated or just not ready. Either way, it’s time to prepare for that old-time routine. For some families who work in education their babes are returning to childcare. For others with school-aged children, the switch back to a school schedule can really affect your littlest ones. Changes in routine come in a number of ways. If you have to wake your child to take children to the bus stop or drive them to school, that affects their sleep routine. Nap times may also be affected and evening routines. It’s also an adjustment for a young child if brothers, sisters, or parents suddenly go from around all the time to missing for an 8 to 12 hour stretch. My husband is a teacher, and our little boys have a few weeks of adjustment to our “new normal” of the school routine because for several months they get used to dad being home all day, every day. Change your routine slowly. Start a few weeks before school if possible. Do a little bit at a time. If, for example, your toddler will return to childcare, try spending a couple of hours away from him or her regularly in the couple of weeks prior. This is, assuming you have a trusted caregiver you can rely upon. Don’t change what you don’t need to. Just adapt to necessary changes, don’t add in extras. If you say, “no more junk food once summer ends,” perhaps a slow transition here is helpful, too. If sleep, time with siblings, and other parts of the routine are changing, keeping other things consistent can help keep a sense of routine in the midst of adjustment. Talk about the new schedule. If your young one is old enough to remember May, talk about how soon your family will go back to that style of living. 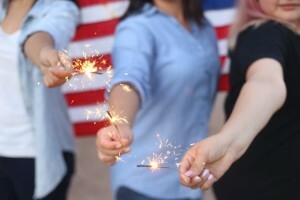 If too young, talk about the changes that will happen, like siblings being gone for the day. Try not to make the mornings rushed. Rushing results in heightened expectations (I need x, y, and z done now…) and an increased likelihood of meltdowns. Prepare what you can the night before. Spend quality time in the evenings or weekends to help reinforce your presence that was so much more clearly tangible all day long during the summer. As the first weeks can be taxing on you as a parent also getting used to the new routine, this can also be rejuvenating for you.